As a shiatsu practitioner and a massage therapist I have been gradually developing ways to incorporate the transformational, powerful effects of shiatsu with my deep tissue oil massage. Meridian massage is a unique combination of deep tissue oil massage, with the use of acupressure points and a focus on the body’s energetic pathways known as meridians. Through working with both the meridians and acupressure points a meridian massage can go deeper into the body, connecting to not only the physical body of muscles and joints but also working with the energetic body, thus strengthening the flow of energy around the body. 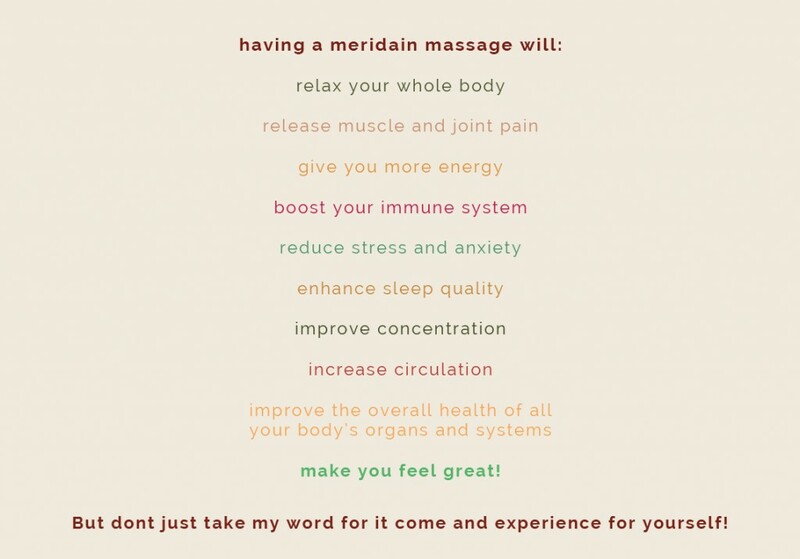 Meridian Massage thus helps to balance the body’s systems and strengthens the flow of energy around the body. This treatment has a deep and profoundly beneficial affect, harmonizing the energy flow of the body, reviving depleted energy, soothing away aches and pains. Leaving you feeling deeply relaxed, nurtured and full of pure healing bliss. The treatment is given on a massage couch, with towels to keep you warm and comfortable. I work on your whole body from each of your toes to the crown of your head, massaging each of your meridians with long, flowing deep stroking moves. This allows the release of stagnant energy within the channels and helps promotes an increase in energy flow through the meridians bringing much-needed balance back to your entire body. I use only the finest quality organic massage oil combined with specific blends of essential oils chosen for your individual needs to help bring balance to your body. These “meridian” oils have been developed to work with imbalances within our body’s energy in relation to the five elements and can help along with the massage to support deep change within the body. Contact Emma via email – emma@bringingbalance.co.uk or telephone – 0777 915 1916 to book.